"Twenty years from now, you will be more disappointed by the things you didn't do than those you did. So throw off the bowlines. Sail away from safe harbor. Catch the wind in your sails. Explore. Dream. Discover." 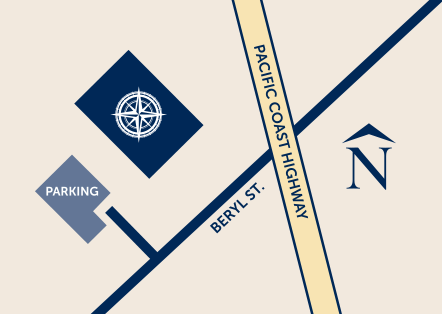 Our visitor parking lot is accessed via a driveway 1/2 block West of PCH on the North side of Beryl Street. Receive financial tips, blog updates and company news. Tariffs, Brexit, Recession, oh My! Investing in a world of uncertainty. Over 22 years ago, Navigoe was founded using an investment strategy designed to hold up through periods of prosperity and recessions, market booms and busts, peacetime and conflict, and political uncertainty. The investment strategy has proven itself as all of these events have come to pass. Over more than two decades, while most investors (and firms) have chased the latest “hot” strategy, Navigoe has remained consistent with the investment strategy we were founded on. Come join us for a refresher on our investment policy, why it has been effective through all of these global events, and how to stay afloat for any coming storm. An investment adviser or IA rep may only transact business in a particular state after licensure or satisfying qualifications requirements of that state, or only if they are excluded or exempted from the state's investment adviser or IA rep requirements, as the case may be. Follow-up or individualized responses to consumers in a particular state by an investment adviser or IA rep that involve either the effecting or attempting to effect transactions in securities or the rendering of personalized investment advice for compensation, as the case may be, shall not be made without first complying with the state's investment adviser or IA rep requirements, or pursuant to an applicable state exemption or exclusion. For information concerning the licensure status or disciplinary history of an investment adviser or IA rep, a consumer should contact his or her stated securities law administrator.